Have you been told you are fault-finding, overly critical, or a bummer to be around? 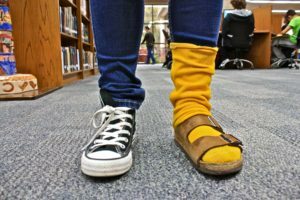 Odds are you are using a mismatch sorting strategy and it is affecting your life. This mindset can prevent joy and connection from happening, leading to loneliness, frustration, and maybe even depression. Sometimes finding what’s wrong is a valuable skill, and in other contexts it can work against you. It turns out that with a little awareness and practice you can learn when to mention what sticks out and when to identify commonalities. This article sets out how to break the fault-finding cycle and discover the secrets of your sorting strategies. Gain the power of awareness and choice about when to use your powers of discernment and when to use your powers of inclusion. “Meta Programs,” according to John David Hoeg, “are mental processes which manage, guide and direct other mental processes.” Think of them as the blueprints that guide how we assemble our thoughts. We have several meta programs at work when we are thinking and communicating. The concept comes from Dr. Richard Bandler and John Grinder and is a core component of Neuro-Linguistic Programming (NLP). I have studied with Dr. Bandler and use this knowledge in my coaching conversations regularly. One meta program is a strategy for sorting by what matches or mismatches. We learn this skill early in life, and it is reinforced, like it is right here, in shows as ubiquitous as Sesame Street. Really read the bolded part of the preceding paragraph. Do you notice something? It is constructed on a premise of “sorting for difference.” It is so subtle that the meta-program attached to it goes unnoticed. Assumed. We collaborate through sorting. In being able to know who is a friend and who is an enemy, what is food and what is poison, and what is air and what is water, we know how to thrive in our environment. We can have ease knowing that we can choose how to sort information based on context and need. Can you tell the difference between the two paragraphs and how they are indicative of a hidden or assumed sorting strategy? Check your internal emotional response to each. Those feelings will help reveal which strategies you are comfortable around. You can choose which approach to take. With a little awareness and practice you can use either strategy for communicating your ideas and opinions with intention. Of course, mismatch sorting makes sense in specific situations. Sorting is part of being human and so is choice. You can choose to build and share ideas on a mismatching foundation or a matching one. Maybe you have a person in your life (or you are the person) who seems to be constantly saying “no,” or can find a flaw in almost any item, plan, or idea. It can become easy to want to avoid people who don’t choose when and how to be critical, and mismatching can seem very fault-finding in social situations. “Mismatch sorting” works in opposition to our social norms because it can make people feel like they are being judged. What is a classic punishment for breaking the law? Shunning. That is, sorting out the person who is no longer welcome. Mismatch sorting begets mismatch sorting with the fault-finding person being iced out. This can be confusing for people who are successful in fields where mistakes are costly, or maybe even a life or death matter. In the workplace, skill at finding mistakes or omissions can be admired, particularly among engineers, software developers, and testers. If your job is to produce clean, error-free code, then writing your sections, code review, and bug reports require a mismatch sorting strategy to weed out errors. If you work in aerospace you need to have a zero-tolerance for error or a pilot’s life will be on the line. This is a crucial skill in these contexts. However, in social settings the same skills are seldom welcome. It’s time to be able to choose which strategy to use, and when. I’m going to be crude for a little bit. You’ve probably heard the expressions “as popular as passing gas in church.” Let’s consider the message of that expression. That ‘natural process’ can be an anti-social act (making a bad smell) in a room full of people involved in a highly social activity. It’s basically harmless, a little embarrassing, and everyone will pretend it didn’t happen (while remembering who did it). Don’t believe me? I found dozens of gags based on this on YouTube (I’ll let you look them up yourself because I don’t want them stinking up my blog post). Using a Mismatch Sorting Strategy in a social setting can also be an anti-social act. By all means, use your powers of discernment to identify errors, bugs, and possible improvements. You are always allowed do that. But just because you’ve employed a strategy to identify “what’s out of place” doesn’t mean you have to share those findings out loud. In other words, the opinion you have formed using a “what’s wrong” framework is the “gas passing.” Hold it in until you find a more appropriate place to make that sort of noise. With practice, you will have more sorting strategies available to you. Practice finding “what matches” and sharing that observation. It will add to the proceedings. When Will You Start Flexing Your “Matching Sorting Strategy” Muscles? We need to be able to see things in our lives through a “what matches” and “what belongs” lens when the situation calls for it. Just like we might mistrust someone who can’t find and fix errors in critical systems, we also mistrust people who seem to be fault-finding in social settings. Are you sometimes frustrated in social settings? Do you feel like you are being “shunned?” It could be you are bringing the wrong strategy to the party. Only expressing what you don’t want, don’t like, or want changed is a way of shifting the responsibility for your satisfaction to another person. Person 1: Let’s go out to lunch. Person 2: Ok, where do you want to eat? Person 1: I don’t know. Person 2: How about Thai? Person 2: What about Mexican? Person 1: I don’t like black beans. Person 2: What about burgers? Person 1: Can’t eat the bun. This goes on for a while in a loop where Person 2 is now attempting to satisfy Person 1.The situation is unfair and frustrating (and exhausting) to Person 2, who has to use a lot of energy trying to mind read what will satisfy Person 1. Person 2 will eventually stop asking Person 1 to lunch, because the amount of energy the interaction requires is too high for the activity. Person 1 owes the interaction a commitment to something, instead of being in a cycle of calling out the mismatch between the offer and a hidden desire for a type of food. If you are in the habit of making decisions from the mismatch sorting mindset, it can be very difficult to get what you want. You will be stuck in a cycle of sorting from an essentially random set of offers. What a sad waste of valuable time. In a future article I will talk about the importance of having baselines and boundaries to define what we actually want. We can be “choosers” instead of “sorters” and get more of what we want in life. I Think I Am Biased Toward Being A “Mismatch Sorter.” How Do We Coach This? If we are working together, this is a general approach to how I would coach you through this change. Just like if I was your baseball coach, I can help you with the concepts and drills, but putting them to work at “game time” is on you. Let’s get to work. Check yourself – when you see something do you immediately gravitate to the flaws or perceived deficits? Do you only care about “what’s out of place?” If so, recognize that. Shut up – Unless you’ve been hired to point out what is “out of place” about something then keep it to yourself. If you share, expect defensiveness and rejection from the recipient as the result. Take notes – recognize where the desire to “be critical” happens. If necessary, journal about what you thought and then in writing reframe the thought into matching and inclusive terms. Take your time and be easy on yourself while you learn to have choices about how you “write” your perceptions in your mind. I have an article about reframing sentences to the positive if you need a refresher. Recognize your thoughts — Getting good at seeing what matches or is a commonality in a situation? Writing it down is no longer necessary? Then you are now in the power of personal choice. Going forward you can decide how you want to sort information and can recognize the proper approach for the proper time. Sharing – Share commonalities and gauge the reaction of people around you. This change could upset your peer group if they all habitually use a “mismatch sorting strategy,” so be warned. Use the skill in a context where calling out a mismatch has gone poorly in the past. Over time you will start to recognize all the possible responses you can make to a situation and choose an appropriate one. Be easy on yourself if you make the wrong choice and back up with humility and switch approaches. Relating To The Content Of This Article? Coaching Can Help. Want to get unstuck? Contact me today to schedule a complementary 20 minute conversation. Coaching could be the answer you are looking for. With coaching we determine where you are headed rather than where you have been. Move to the future and get unstuck with the help of a coach.